You don’t need to read very far through this blog to know that I’m passionate about the NHS. I believe it’s Britain’s, and Labour’s, greatest achievement and the country’s greatest treasure – and that it’s under sustained, ideologically-driven and multifaceted assault by the Tory-led coalition government. The latest phase in this assault is the undemocratic ‘negative resolution’ that the government initiated, with typical sneakiness, just before the current Parliamentary recess. As I explained in my last post, this little-known procedure, abusing section 75 of the Health and Social Care Act 2012 as its justification, has started a 40-day countdown and if opposition MPs are unable to block it successfully, it will become law – and will break explicit, written government promises in order to force the new Clinical Commissioning Groups to put every NHS service out to competitive tender, even if they don’t consider it to be the best for their patients. 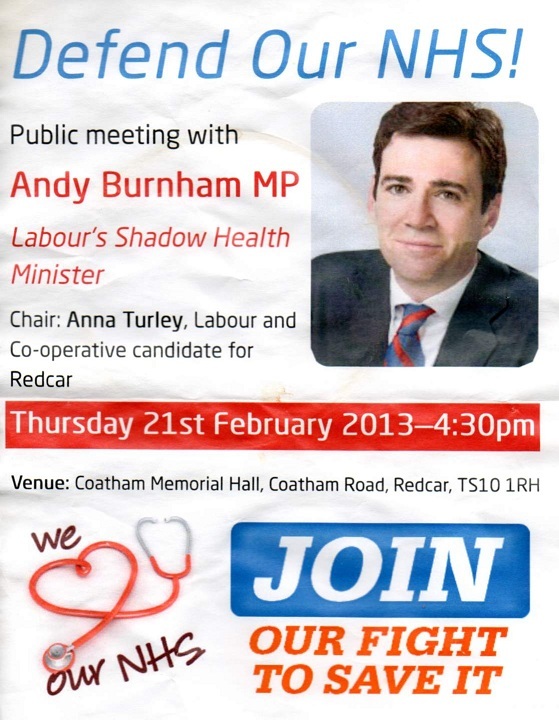 It’s not going to be an easy fight, so it was with some trepidation that I went to a public meeting last night on the NHS with Shadow Health Secretary Andy Burnham and Labour’s parliamentary candidate for Redcar, Anna Turley. We’ll start with the most pressing matter first. I got the chance to ask Andy about Labour’s plans to block the government’s resolution – and what they could do, if the government succeeds in forcing it through, to minimise its effects until the next General Election in May 2015 or sooner. On the Parliamentary battle, he responded unequivocally that Labour is busy making plans for immediate action as soon as Parliament resumes next week and will ‘lay prayers’ against the resolution in both Houses of Parliament, and will fight tooth and nail to defeat it. He expressed hope that LibDem MPs, who by now must realise that the Tories have lied consistently to them about the implications of the 2012 Act, will join forces against the Tories – but it was hope rather than expectation, as the LibDems’ record of resisting their Tory leashholders has been woeful so far. For this reason, he appealed to all of us to be active and energetic in pressuring our MPs to join the resistance against SI257, and to campaign hard to defend the NHS. With regard to steps that can be taken to minimise the damage of the resolution if it goes through, he reiterated a firm, unambiguous commitment to repeal the 2012 Act as a priority once Labour is back in government, and to restore the lead on the commissioning of health services to local government. However, by that time much irrevocable damage will have been done, so concerted interim action is needed. His view was that the NHS Constitution would offer the best legal basis for local individuals and communities to challenge, delay and even overturn awards of health tenders to private companies. I’ve been reading the Constitution in detail, and it does contain some rights for the public and staff, and some duties for NHS bodies, that seem to have potential for a ‘rearguard action’ to delay the progress of private tender awards. I’m in the process of contacting MPs, unions and other NHS campaigners to explore what can be done, but I have an idea in mind if it turns out to be feasible, so watch this space. However, while the resolution is still in process in Parliament, nothing should distract us from the urgent priority of getting it killed at this stage, so please see my last article and get writing to your MP! Andy stated that he felt that Labour had allowed too much ingress of private companies into NHS provision during its last period in office, and that his vision was to restore an NHS closer to its founding principles – but with a new and extended scope. The Tories have targeted the integration of healthcare and social care, but without question this is a backdoor means of degrading the NHS even further. By reclassifying services from ‘free to all at the point of need’ healthcare into means-tested social care, the Tories hope to introduce health tariffs by stealth – to vastly increase the extent to which people have to pay for care while reducing the cost of hospital care so that they can give further tax-cuts to the wealthy. This has been demonstrated by their decision to impose a much higher ceiling on social care costs than that recommended by Andrew Dilnot even as they continue to siphon funds out of the NHS toward social care costs and even just to fill Treasury coffers. This starvation of funds inflicted on both aspects of care is resulting in dangerous gaps and is preventing successful whole-person care – and has added ‘fear of old age’ to the great evils of sickness, worklessness etc identified by Aneurin Bevan, the driving force behind the foundation of the NHS. A complete state of physical, mental and social wellbeing. The NHS, treasure though it is, has primarily focused on physical wellbeing – mental health has been run largely as a separate service, and social wellbeing has been even more discrete. His vision for the NHS is to integrate all of these into a single service – but crucially, while maintaining the NHS’ founding principle of ‘free to all at the point of need’. How this would be funded is still under investigation, but the fact that Labour has a huge, ambitious vision for a truly integrated, truly socially-funded NHS should give massive encouragement and inspiration to all people of good will and be, as Andy said, ‘an election-winning proposition‘. Andy said very clearly that he doesn’t believe in the principles, so beloved of the Tories, of a marketised NHS and ‘any qualified provider‘. If Labour win the next General Election, he will reintroduce a preferred provider policy that will allow genuine NHS organisations to be named as the providers of choice, thus ensuring that the NHS remains, at its core, a public institution. This will restore the NHS to leadership of health service provision, alongside local government as the commissioning lead. Andy quoted a nurse who said to him that there was, compared to when she qualified 20 years ago, a big swing toward patients in their 80s and 90s. He said that we should be celebrating the fact that many of us are living longer, rather than treating it as a scenario of doom and difficulty as the Tories do, but that in order to ensure that nurses are equipped to be able to provide the standards of care that they want to provide – he doesn’t believe that nurses think they are ‘too posh to wash’ – he will be looking at the balance in nurse training between the academic and the ‘hands-on’. How can caring for us in our old age and need be a minimum wage business?! before addressing the conflict that the current system creates between acute and social care, with patients forced to stay in expensive hospital beds as a false economy because of under-investment in social care structures, and promising to use successful examples of any type of care as the model for ‘best practice’ around the country. We need to stop squabbling over the centre ground and launching micro-initiatives..we’re going to say clearly: we want a more equal society. This is exactly what we need – and should start to break the ‘they’re all the same’ paradigm that the Tories carefully foster to keep people apathetic and bereft of hope for genuine change. Andy spoke of the NHS as Labour left it in 2010: the highest-quality health service in the developed world – and the only one in the G20 that could say it provided comprehensive, social healthcare for less than 10% of GDP. This, he rightly insisted, is an absolute bargain and the idea that privatisation with its profit-layer could provide a better, more cost-effective solution is just nonsense. The NHS is not just the fairest and most cost-effective solution now. The only way to face 21st-century healthcare challenges is a fully public, truly national NHS! I could only rise to my feet and applaud. I went to the event last night with serious concerns but excited about the chance to ask questions about those key issues. I left uplifted, inspired – not without concerns for what will happen over the next couple of years under this woeful, malignant government, but and filled with renewed hope and renewed appetite for the fight. Because what will follow this government’s downfall is worth fighting for, and the more we can protect the NHS up to 2015 the sooner we’ll see the bigger vision realised. Thank you Andy Burnham for taking the time to come and communicate the vision, thank you to Anna Turley for setting up last night’s public meeting – and thank you Labour for returning to core principles and being prepared to stand up and speak out for ordinary women and men that this government is trying to grind into the dirt. Superb vision and proof that Labour in returning to the genuine founding principles of both the party and the NHS are the only party worth voting for if you are serious about removing this disgraceful coalition government from office. I am concerned about the phrase “a firm, unambiguous commitment to repeal the 2012 Act as a priority once Labour is back in government, and to restore the lead on the commissioning of health services to local government” It means that private companies would still be able to tender. Whether by straight dealing, or by other means, this would continue the privatisation of the NHS. The mention of possible damage incurred is not placed alongside any mention of obtaining recompense and restoration. I would also have liked mention of care home financing. You need to look at the section on ‘preferred provider’ status. There wasn’t enough time in the meeting to answer all the questions people had, so there was doubtless loads to talk about that wasn’t said – however, care homes would be covered under the aim to integrate health and social care completely, and make both ‘free at the point of need’. hi steve, it’s great that you raised the SI257 issues with burnham and his response does sound somewhat encouraging – let’s hope they stick to it. however having read both the constitution and the regs, i’m not at all convinced that the constitution will offer much to defend the nhs if these regs go through. did you get a chance to read them yet? they really are terrible! Working through – not giving up hope yet! SI is also being challenged in Parliament on technical grounds. The clue is in the name NATIONAL Health Service. Forget commisioning to local authorities and all the other claptrap. Thatcher started this and New Labour Blairites continued it in 1997. I no longer trust Labour. I want to hear the NHS is to be run as a national organisation with the necessary funding and private tenders outlawed. Don’t know about Labour though. The party leadership successfully fought against including a pledge to remove the marketising internal market from a resolution put forth by members at Labour Conference last year. The condemnation of PFI barely made it through thanks to the efforts of the member defending the resolution and led to Andy Burnham acknowledging that “some PFI deals were not very good value for money” or words very close to those. The true hope for the NHS is proper privatisation. Not some wishy washy one like with the railways or the mail. All hospitals should be private. They would be more efficient when the people running them have a personal stake in them like at Hinchingbrooke Hospital. Figures from the NHS itself prove that private hospitals are better. Health care MUST still be free to all and that can still be carried out with private hospitals but with state paying the costs. The French system is the one we should be aiming for. The yank system is crap. Sorry for spoiling your socialist heaven with real figures that show conclusively that private hospitals work. And read the Telegraph article before replying. Preferred Provider status implies that the NHS could fail to secure the tender, or does it have the meaning of Privateers need not apply, in which case what’s the point of putting services on offer? Still sounds like weaselling to me. As enthusiastic as Burnham goes,labour are disasterous.He gets no backing from Milleband.No other labour MP is bothered at all. It is a theory I have that the majority of mps have private healthcare,and cannot be seen as hypocrites to be crying for the NHS while having private healthcare.So they would rather see the NHS go down the tubes than be seen as hypocrites. Surprisingly[or not! ]’Red’ Ken Livingstone has private health care.Apparently many of the BBC staff have private healthcare.That would account for a similar silence from them on the NHS. Maybe voluntary privatisation is already underway in the houses of the media and politics.Politics works for the rich and against the poor.God help us. We reach for the clouds,gargling in the trough.God help us. It’s terminology – effectively it’s about closing the list of organisations who are allowed to bid for services. I don’t want an accountant or doctor with his eye on profits deciding if and/or which treatment I should receive. Health professionals should not have to worry about cost. Their concern should be only for the wellbeing of patients. Get back the £21 TRILLION tax deficit in offshore accounts to easily pay for it. I have other objections, but those three are enough to convince me that the profit-motive has no place in health at the sharp end.